I represent Buyers and Sellers every day and I know what it takes to get a home sold but when I decided that I was going to sell my own personal home that opened up a new door to what it’s like to be an actual Seller. I’ve bought and sold lots of properties throughout my life but this one is a little different. We moved into this home when our daughter was just 18 months old and it was a very nice home but a single man had built the home and only had grand children so it was very masculine and needed a woman’s touch. The first major renovation we did was the front door. This door was designed by Jay and I and was built by My Door Company from Peyton, Colorado. This door is magnificent in every way! We chose solid mahogany wood, double obscured glass and beautiful modern hardware. Warm your welcome when you open this gorgeous door! The second renovation we did are the the reclaimed wood floors. When you first walk into this home you can’t help but notice the floors. These floors are so unique in every way. They are from an old barn out east and show the sawn and distressed marks. 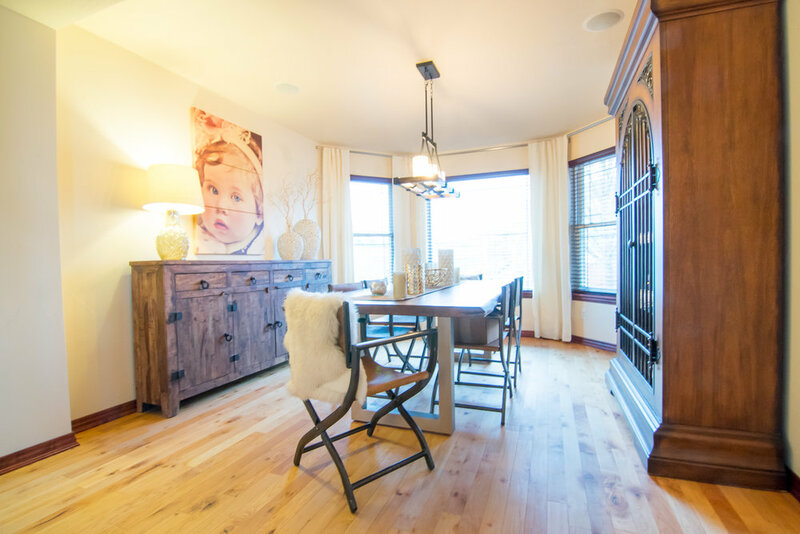 These floors we’re done by Reclaimed Designworks in the Denver Design Center and are in the family room, the master bedroom and the top of the landing upstairs. Now onto the kitchen! We didn’t do too much here as the kitchen was pretty good the way it was but just need a little update. We updated the dishwasher and refrigerator to Jenn-Air, painted the cabinets with Sincere White by Sherwin Williams, replaced the backsplash with a honed marble subway tile and installed new oiled rubbed bronze hardware pulls. The next redesign was in the dining room. This room is behind a wall next to the kitchen but was never used so we made it into a family study and moved the dining table into the family room and made a formal dining area off the deck so you can enjoy the view and be right off the kitchen. The family study and our beautiful dining table is now used every day! This room was also painted with Sincere White by Sherwin Williams and the floors were stained a dark walnut by Beyond Hardwood Floors. Now onto the basement! The walk out basement is such a bonus! This was a blank room that we made into a play room and media room. This room gets used every day and we love spending family time here. The new LED lights and paint make a huge difference and we love spending time in this area. The walk out basement is so great! Every morning I use this are for yoga and love watching the sunrises. Out the doors of the basement is a beautiful covered patio and pergola with hot tub and large fenced yard. The hot tub is made by a local company in Lafayette called Wind River Spas. This has been such a great home and we loved so many things about it. It's been so much fun designing it the way we have and learning about new home design trends along the way. We may have been a little ahead of our time though when we purchased this home as we are finding ourselves needing a community that has more younger children, more families our age and closer to the conveniences like a grocery stores, restaurants, walking and biking trails and a community center with a pool, fitness center and other activities for families to do. We have decided to move to Broomfield to a neighborhood called Anthem This is a very family friendly neighborhood with walking and biking trails, an amazing pool with a slide and a community center that offers so many fun things for families. I've represented several Buyers in this neighborhood and always finding myself wanting to live here. It took some negotiating with Jay to sell our home in Brighton and move to Anthem but we've finally made the decision and are on our way. Stay tuned to find out what we are going to be building and the journey of new construction home buying. If you want to know more about this process I've written a blog on my business page about new construction and why you should hire a Realtor to represent you. Check it out here! All Photos by Walnut Street Photography. I am a full time REALTOR®, real estate investor and entrepreneur. I have lived in Colorado since 1978, I have been happily married since 1999, I have a beautiful daughter who was born in 2011 , two dogs. I have been involved in the Denver real estate market since 1998. My real estate experience has provided me with many valuable skills including: * Pricing * Curb Appeal * Attention to detail * Financial Aspects of Real Estate * Building Construction * Constant Clear Communication * Conflict resolution I believe listening and communicating with my clients is the foundation of my success. I am committed to superior service and attention to detail whether you're buying, selling or renting a home, condo, vacation home or commercial property. Specialties: Denver Loft and Urban Properties sales and property management. Commercial leasing, sales. I am interested in, motivational books, yoga, exercising, snowboarding, Longboarding, wine and traveling.